Guardians of the Galaxy #3 review: The three factions – AiPT! The Marvel Cosmos is in chaos. 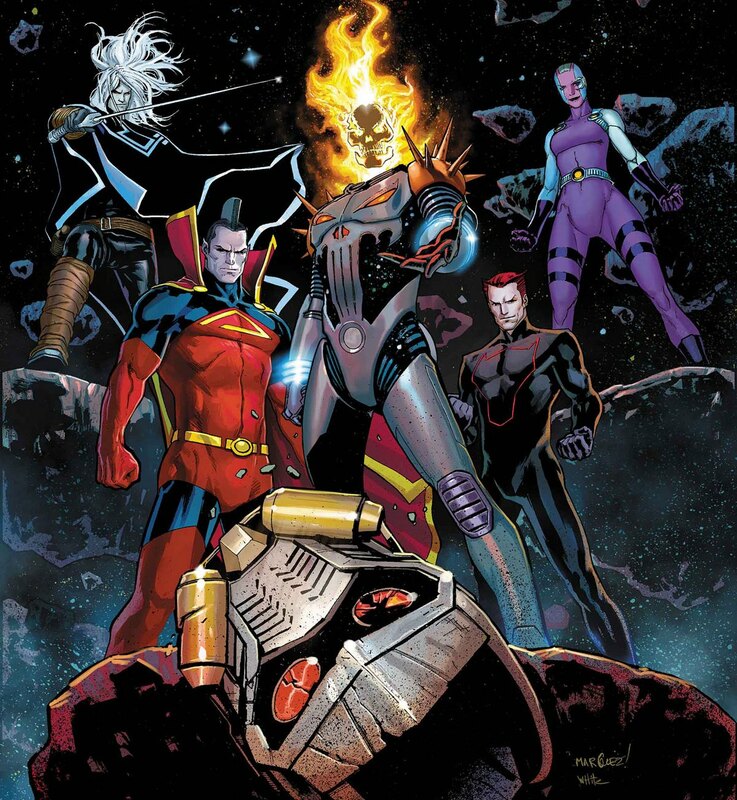 The Black Order’s struck against the legion of heroes, villains and others that roam the space-ways. Now, a new Guardians team begins, as well as two others. Starfox has assembled his new Dark Guardians and Hela now controls the Black Order. With three great factions vying for power as the hunt for the new Thanos rages on, things are heating up. Donny Cates has, over the last two years, become known for his sprawling cosmic stories. And he does them best when paired with his chief collaborator, Geoff Shaw. Bringing an appropriate sense of scale and scope, Shaw’s storytelling brims with the potent power that makes for a crackling combination. The two of them together, working with Marte Garcia and VC’s Cory Petit, have made the book a roaring ride throughout the cosmic world of Marvel, spanning Human Rockets, Negative Zones and Death Goddesses. Although a bit slow to start, having snapped the entire cosmic crews of Marvel away into a Black Hole in the debut issue, the book is building nicely thus far. The team’s choices make more and more sense as the story progresses, as more pieces begin to join together. If #1 was the origin of the new Guardians of the Galaxy and Hela’s Black Order, with the second being the origin of the Dark Guardians, this is the bridge issue that sees them all making their plays in order to accomplish their end goals. As such, the entire issue is segmented into three fragments, with each following one of the three factions at the heart of this final gauntlet of Thanos. The missions are simple and as follows: The Guardians want to save Gamora, who is and will always be family to them. The Dark Guardians want to kill Gamora, who they believe will be the new Thanos, the new vessel in which he will be reborn, as implied in his will. The Hela Black Order, on the other hand, hope to be together with and aid the new Thanos, however he returns to the universe. It’s a solid setup, permitting the creative team to create and handle a big cast and universe around a clear, simple focus point. And for an opening story arc, that’s pretty much what one could want. And all the while, the book becomes a grand tour of Marvel space, treating old readers with its additions and obscure inclusions while intriguing newcomers with a great sense of world-building. It’s a solid approach to help make a landscape that can seem vast and impenetrable more accessible, without having to strip away its layers. Cates’ reverence and grasp of the world and characters is evident, as he balances Jim Starlin-scale with Jason Aaron-esque moments of raw emotionality, finding a sweet spot between cosmic operatic drama and more personable characters. Shaw’s really the one who makes it worth it though, doing the hard duty with having to juggle so many characters that come with a book that’s no mere ensemble but an entire universe of characters. Every splash or action scene is executed with the power one might hope for, fitting the content’s tinge of grit and blockbuster scope. From a massive team shot, a minor character moment to visceral action and carnage, Shaw can draw it all. Starfox’s doubt and rage, Thanos’ smug confidence, Peter Quill’s agony and even Groot’s certainty are rendered in perfect form, displaying the artist’s prowess. Garcia is an admirable figure of the book here, jumping between the neon blues and greens to careful blacks and reds. The lighting contrast between interiors of spaceships and inhabited planets or even the Negative Zone is a striking display of the work Garcia has to put in, helping contextualize and bring to life the universe that is being shown and rebuilt here. It’s familiar, but it must also feel all new, all vital and all special. Garcia helps make that happen. Petit’s lettering work is also very much the unsung heroic endeavor of the book here. The consistently solid letterer does great work, utilizing different styles and balloon colors for each character with distinctive speech, helping emphasize the wide variety and rich texture of the universe being shown. Wraith’s black balloons with white text stand, full of his formal speech is a far cry from Annihilus’s green balloons with white text which convey his hissing voice. Similarly, Hela’s divine and sleek medieval-esque font is vastly different from Beta Ray Bill’s own noble tongue, which is a bit more loose and spaced out, carrying weight. The creative team pools together all their strengths nicely here and does some fairly interesting things. Starfox’s journey and introspection as he heads down the dark road of potentially becoming his monstrous brother is a curious choice with intriguing implications. Laying bare his insecurities and sense of inferiority and yearning for a purpose, a meaning, the team gives the character a struggle that feels intimate and real. Meanwhile, Peter’s own struggles, as he drowns his sorrows in alcohol, feel true and understandable. He’s at a low point, much like Starfox is. And he’s lashing out in pain, retreating inwards and trying desperately to wash away the feelings he wish he didn’t have. The contrast and parallels with these two leaders of Guardians teams, with Hela, the Death Goddess, is intriguing. Hela’s also in a similar place, although she doesn’t show it. Being an immortal goddess, she merely holds resolute in her feelings towards the man who rejected her and keeps on going. The book is, in many ways, how people process and deal with death, which should be no surprise to Cates fans. There’s also a fun little nugget that utilizes the character of Wraith and ties him to some other big Marvel Cosmic stuff that’s being built right now and it’s also something of interest. Guardians of the Galaxy continues to keep up its momentum and boasts intriguing surprises and directions, offering up a delicious universe that Galactus would certainly be chomping at the bit to consume. The parallels between the various cosmic faction leaders. Starfox, Quill and Hela all have intriguing journeys ahead. Thanos, despite his death and absence, continues to have a fascinating impact on the universe and its cast of characters and it's great to watch. The various factions, their rosters and missions and the teases of many more, are all interesting. Inviting and exciting for new readers while enjoyable for old Marvel Cosmic fans. The book is definitely taking some time to ramp up and get going and is very much setting things up at the moment. Should read much better when the story is done, although there are plenty of great moments in every issue. The tease and promise of Nova from #2 isn't quite delivered upon like one might hope. He has a very minor presence in this specific issue.